The following letter was sent on 23rd August 2011, by Honda and Ecotricity. Reviewing all the information and comments we have received from Swindon Borough Council and the local communities, Honda and Ecotricity have put forward an alternative proposal for two wind turbines only. The wind turbine originally proposed towards the north side of the site, which was closest to residents, will not be included in the alternative option. We believe this alternative option for two turbines will still make a valuable contribution towards the ambitious business efficiency and environmental targets Honda has set itself, both globally as a company and locally as a site. Taking into account the strength of local opinion at the two previous Planning Committee meetings, this offers a pragmatic workable solution that addresses the concerns of the local community, whilst enabling Honda to remain competitive in a global market and reduce its environmental impact. 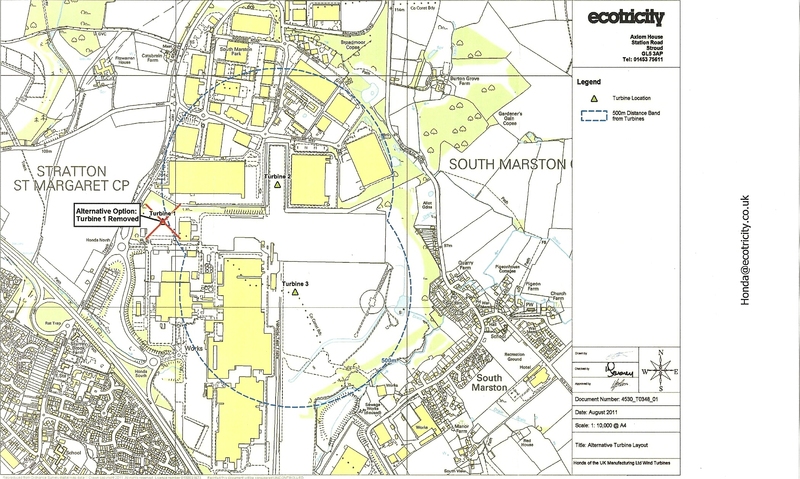 Honda and Ecotricity still firmly believe that all three turbines originally proposed are viable, and this is reflected in the fact that they have been previously recommended for approval by Swindon Borough Council. If this was not the situation Honda would not have presented three turbines to Swindon Borough Council for consideration. The plan on the reverse of this letter shows the alternative option and which turbine would not be progressed if the Council approved only two turbines on the Honda site. Swindon Borough Council will now consider this alternative option and we hope they will be able to make a decision on the application by early October 2011.